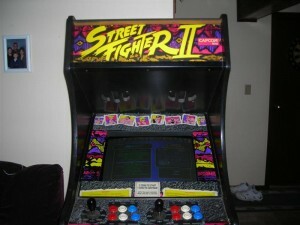 A friend of mine pointed out that he had just built a Street Fighter Mame gaming cabinet with a 42 inch screen and 2 controllers his goal was to create the ultimate Street Fighter rig to relive his child hood. For those of you who are like me that had no clue what a Mame Cabinet is I have seen it and I am going to eventually make some time to build one but just to give you an idea of what I am talking about. I never realized how elaborate you can get with this some people have the trackballs 4 controllers just over the top type cabinets. My friend dropped a computer inside of his cabinet so he could play multiple roms. Very cool and good luck to my friend Andrew.